Prof. ZHANG Jiang, First Vice President of University of Chinese Academy of Social Sciences (CASS), Former Vice President of CASS. ZHANG Jiang, Ph.D. and Professor of Literary Studies. 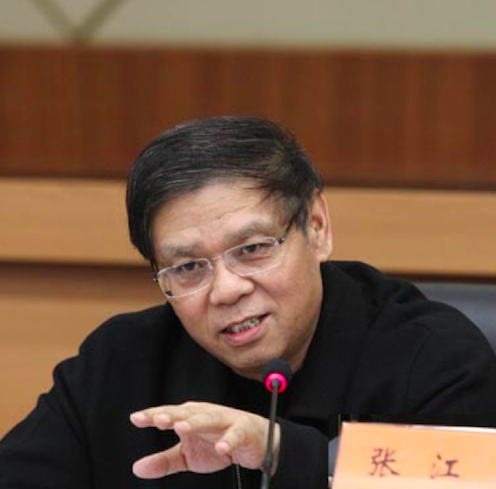 He is currently Vice President of the Chinese Academy of Social Sciences (CASS) and Editor-in-Chief of Social Sciences in China Press (SSCP), Social Sciences in China, Chinese Literary Criticism, Social Sciences in China Review and Chinese Social Sciences Today. He is also Chairman of Chinese Society for Literary Criticism (CSLC) and the expert of the Review Committee of The National Social Sciences Fund of China (NSSFC). He has long been engaged in research on literary theory and criticism. Many of his articles were published in Social Sciences in China (both Chinese and English edition), Oktyabr (Russian literary magazine), Comparative Literature Studies (US), Literature & Art Studies, Literary Review, Philosophical Researches among prestigious academic journals, and in People's Daily and Guangming Daily among the best-known newspapers in China. Some articles are re-printed in The Xinhua Digest, Chinese Social Sciences Digest, Reprinted Data of Renmin University of China and other periodicals. In recent years, his concept “Imposed Interpretation” has aroused intensive and extensive discussions and received enthusiastic responses in academia both domestic and abroad. Some of his representative works are: “Imposed Interpretation: Querying Contemporary Literary Criticism”, “Identification of issues Concerning Contemporary Western Literary Criticism: With Concurrent Reflections on the Reconstruction of Chinese Literary Criticism”, “On Theory-centric Literary Theory: A Discussion Starting from the So-called Literary Theory without Literature”, “Discussion on the Periodization of the History of Western Literary Criticism”(series), “Can the Author Die or Not”, “The Presence or Absence of ‘Intention’”, etc. Delman, Jørgen, PhD, is Professor of China Studies at University of Copenhagen. His research examines state-society relations and political change in contemporary China. Currently, he focuses on China’s climate change politics, climate governance at city level, energy and energy security politics and renewable energy. He is one of the coordinators of the Sino-Nordic research network Urban Governance for Sustainable Cities (UGN). His recent publications include: “Urban Climate Change Politics in China: Fragmented Authoritarianism and Governance Innovations in Hangzhou” (2016), Brødsgaard, K. E., A. Mertha (eds.). Chinese Politics as Fragmented Authoritarianism: Earthquakes, energy and environment, Routledge; “From ‘Worn’ to ‘Green’ China Model? Energy in the 12th Five-Year Plan in an Environmental and Climate-change Perspective”. Moe, Espen, Paul Midford (eds.) with Ole Odgaard) (2014). The Political Economy of Renewable Energy and Energy Security. Common Challenges and National Responses in Japan, China, and Northern Europe. PalgraveMacmillan; (2014). “Climate change politics and Hangzhou’s green city making”. Björner, E., P.O. Berg (eds.). Branding Chinese Mega-Cities: Policies, Practices, and Positioning. Cheltenham, UK: Edgar Elgar Publishers;. “Fuels for the Future? The Emerging Architecture in China’s Liquid Biofuels Market”. Louis Augustin-Jean, Björn Alpermann (eds.). The Political Economy of Agro-foods Markets in China. The Social Construction of the Markets in the Era of Globalization. PalgraveMacmillan (with Yu Wang) (2014). Hjort, Mette is Professor of Film Studies at the University of Copenhagen, Affiliate Professor of Visual Studies at Lingnan University in Hong Kong, Affiliate Professor of Scandinavian Studies at the University of Washington, Seattle, and Professor II at the Department of Art and Media Studies, at The Norwegian University of Science and Technology. She is the author, among other things, of Small Nation, Global Cinema (2005) and Lone Scherfig’s “Italian for Beginners” (2010), and the editor, with Ursula Lindqvist, of A Companion to Nordic Cinema (2016). Her current projects focus on moving images in relation to talent development, issues of value, environmental aesthetics, and well-being. Some of these projects build on fieldwork undertaken in West Africa, East Africa, and the Middle East. Jensen, Klaus Bruhn, dr.phil., is Professor in the Department of Media, Cognition and Communication at the University of Copenhagen. His research covers Internet and digital media, communication philosophy and theory, and research methodology. Publications include A Handbook of Media and Communication Research: Qualitative and Quantitative Methodologies (Routledge, 2012, 2nd edition; Chinese translation forthcoming by China Social Sciences Press), Media Convergence: The Three Degrees of Network, Mass, and Interpersonal Communication (Routledge, 2010; Fudan, 2012), and the International Encyclopedia of Communication Theory and Philosophy (Wiley-Blackwell, 2016, 4 vols and online). Liu, Jun, PhD, is an associate professor of Communication and IT in Department of Media, Cognition and Communication, University of Copenhagen. His research stands at the intersection of communication, technology, politics, and society with particular attention to the social, cultural, and political implications of digital communication. Drawing upon theories from communication, sociology, and political science, Jun’s research focuses on how digital technology interacts with socio-cultural forms and settings and generates new power dynamics in politics in specific cultural and institutional contexts such as authoritarian regimes like China. Tamm, Ditlev, dr.jur., dr. phil., is Professor at Faculty of Law, University of Copenhagen. Since 1978 he has been in charge of the chair of legal history as an ordinary professor of the history of law. Ditlev Tamm has been responsible for the teaching of Danish Legal History, European legal History, Comparative law and Church Law at the law faculty of the University of Copenhagen. He has also published several books on Danish political history and within the field of general cultural studies and the study of learning and the history of Universities. He has published several articles in Danish, English and French on the law of the Church and in fields of Moral Theology and the Law. He has been a guest lecturer on the theme of Church and State in the Universities of Firenze, Oviedo and Strassbourg. Professor Ditlev Tamm is a member of the Royal Danish Academy of Sciences of several other Danish academic associations. He has been a member of the board of the Max-Planck-Institut für europäiche Rechtsgeschichte in Frankfurt, he is a member of the Instituto di Investigaciones de la Historia del Derecho in Buenos Aires and of the Instituto Instituto Internacional de Historia del Derecho Indiano, of the French Société d'Historie de Droit and the International Academy of Comparative Law. He is honorary doctor at the University of Helsinki (dr. jur. h.c.). He has lectured in English, French, German, Italian and Spanish at several European and Latin American Universities. He has a working knowledge of Classical languages and Russian. 1994-95 he was guest professor at the University of Kiel. He has been awarded the Sarton Medal for Law 2004-05. Xiang, Wen, Ph.D., is an assistant professor at Faculty of Law, University of Copenhagen. His research interests lie in the fields of environmental law and policy, climate change and energy law, risk regulation, dispute resolution, and China-related topics in an interdisciplinary context of law, culture, politics and economy. His current project focuses on the role of emerging digital globalization on cultural and legal convergence and/or divergence in China and Denmark. Xiang Wen was a visiting scholar at School of Law, Duke University, and a post-doctoral research fellow for a University of Copenhagen (KU) 2016 Excellence Programme. He has been a lecturer in international environmental law course, as well as a guest lecturer for Chinese Legal Culture, Gender and Legal Culture courses, etc.